Long hairstyles give you a whole lot of versatility. There are so many great hairstyles you can try out that will make your overall look pretty, edgy, bohemian, rocker chic, or whatever else you’re going for. It’s hard to create a list that fully encompasses all of the different styles you can achieve from having long hair, but here we have our best attempt. This is a list of 100 great long hairstyles –	ideas for how to style long hair. This is a cute long hairstyle that emulates a messy bun, with chic braids leading to the back. 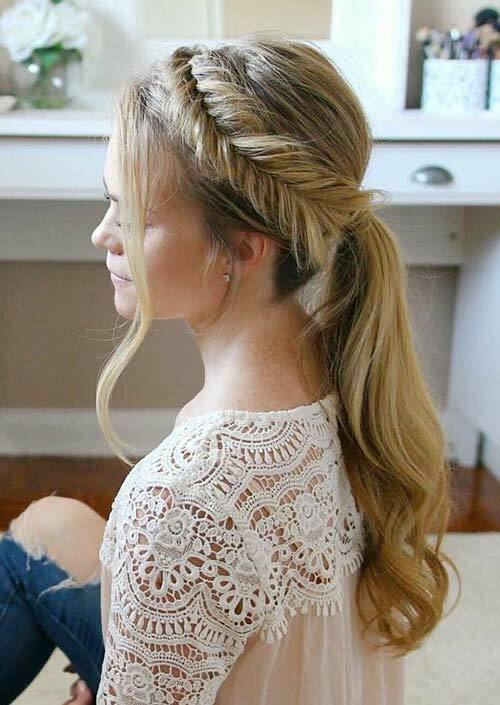 This style celebrates your long, wavy hair, and also gives you the cute visuals of a messy bun and braids. Plus, this style features the trending dark to light highlights. 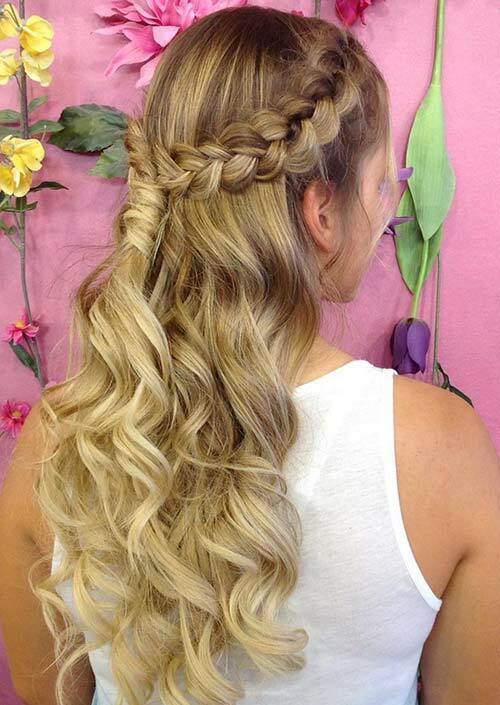 This hairstyle features long, wavy hair with a fishtail braid using some of the hair in the back. 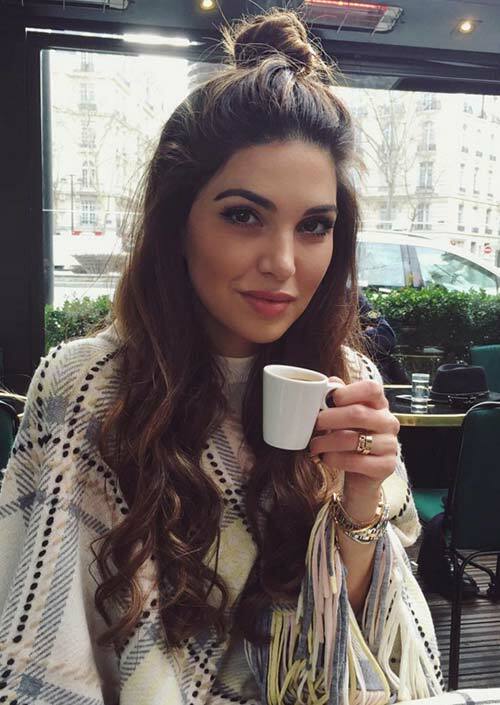 This is definitely a style for women with thick hair, since it takes quite a bit of hair to pull off the braid and the full, wavy hair around it. With this long hairstyle, you can keep your locks out of your face while still keeping everything cute and chic. The blonde hair here comes in layers, with some platinum being mixed in with deeper shades of blonde. The braids on the side pull back into the ponytail, which helps take away from your volume as well. This low-hanging bun is characterized by the large, flat braids on either side, leading down into and across the top of the bun. 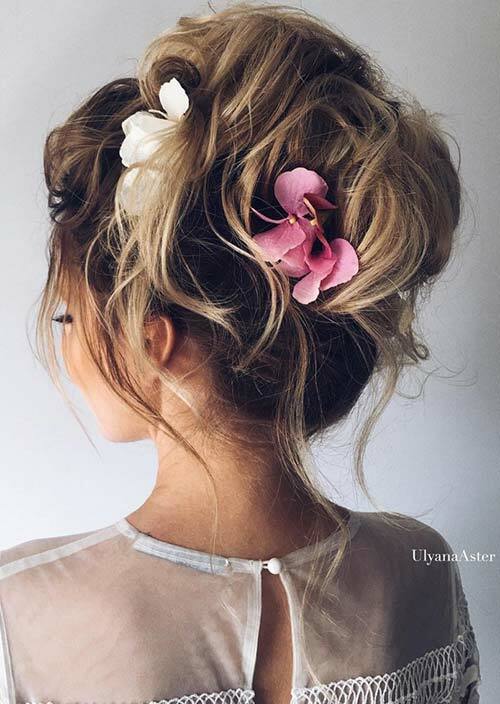 This is such a summery hairstyle for long hair, and is perfect for anything from a formal occasion to a day out at a fair. 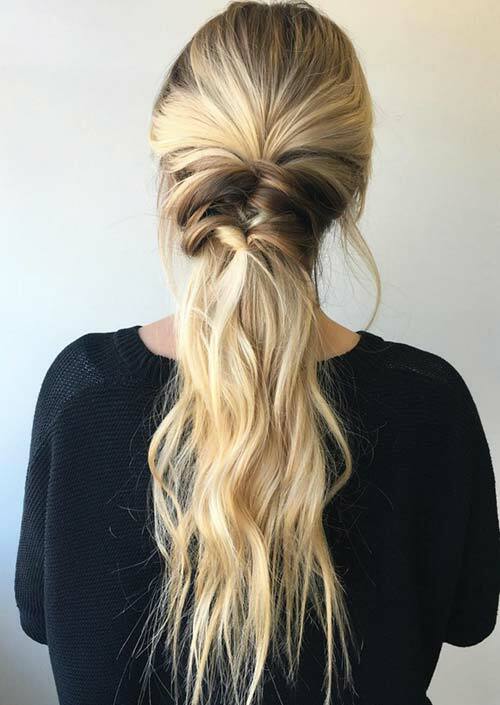 The stack of brown and blonde in this long hairstyle is chic when broken up by a cute hair accessory, separating the simple ponytail from the asymmetrical top. The way the top is folded with a bobby pin, which adds a bit more character to an easy everyday hairstyle. If you’re looking forward to an elegant event this summer, but don’t know how to style your long hair, this may be a great option. It is a classic, sophisticated bun that you can easily style with a lovely pin or clip, and it will stay out of your face for your event. This is a messy style for a long braid, with all of the hair being used to keep it right in the center for a funky mohawk appeal. This hairstyle showcases your voluminous hair in a new, front-and-center way, so you’ll be able to make any passerby jealous of your beautiful tresses. 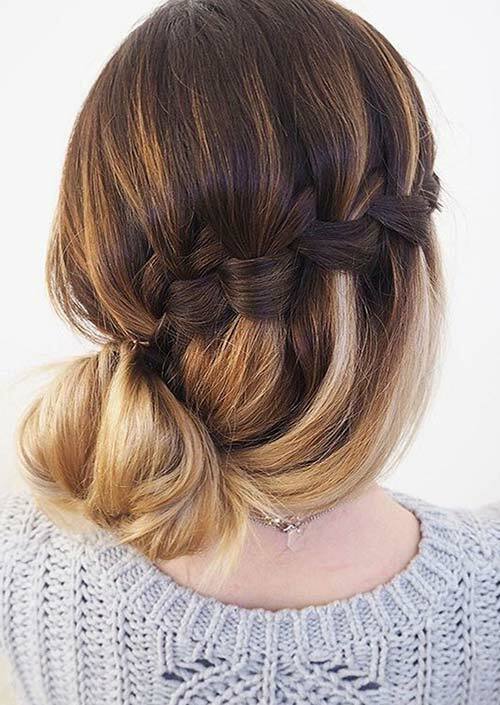 There are no bells and whistles to this cute and elegant hairstyle. It is worn down and curled, showing off the beautiful blonde highlights. With a simple headband being the only adornment here, this is a versatile, everyday hairstyle for long hair for any occasion. 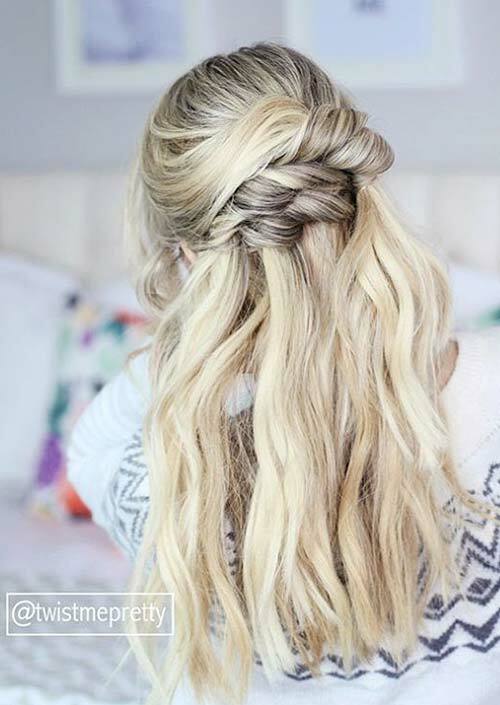 In an icy blonde and brown color, this long hairstyle is pulled half up in the back with lovely twists. 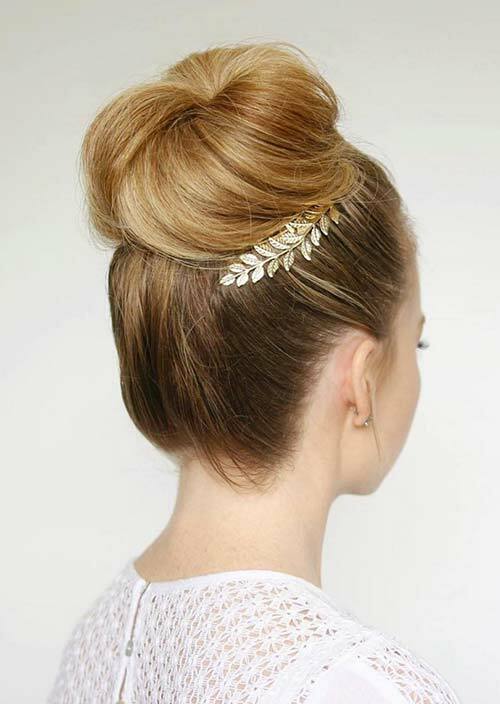 A great holiday style, this hairdo would also look beautiful any other time of year. It is an easygoing style that will look nice all day, whether it’s messy or sleeker. This is a hairstyle you can have fun with. The knotting done to complete this ponytail is rather simple and straightforward, and there’s a bit of leeway to put your own twist on this style. It’s a great riff on an everyday ponytail. 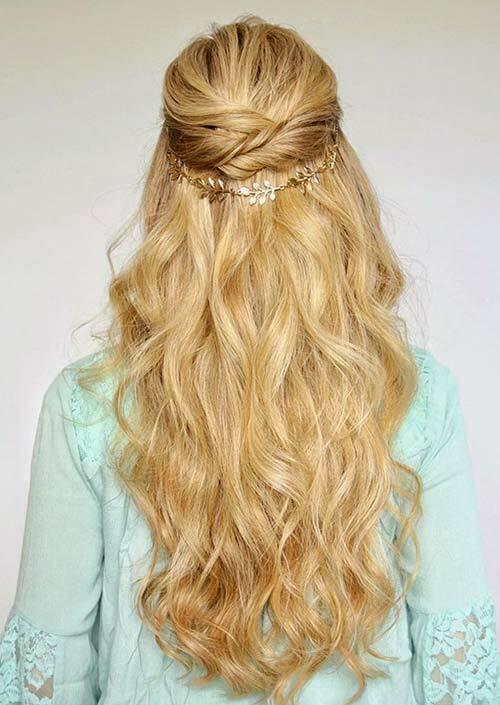 This cute long hairstyle uses all of your luscious locks in a messy braid, pulled into the back. It is a lovely, feminine braid made even cuter with a flower on a headband being woven into the braid as well. It is a messy way to keep your hair up during the summer. For extra-long hair, this ‘do features many different sections. You have a section of shiny, straight hair encased by a braid on either side, which all braids together to become one at the base. This has three great styles for long hair all in one! This is a straightforward braided crown, here seen accompanied by a crown of flowers. Keeping the bangs loose around the face adds another texture to the style, and takes away from the primness while still keeping it sophisticated. 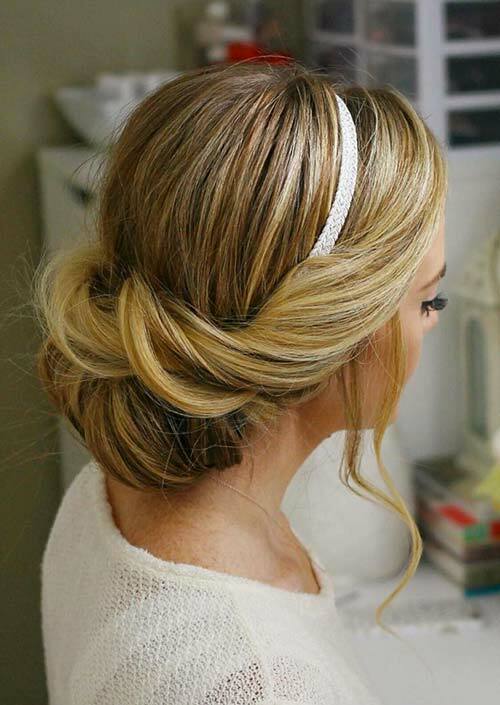 This is a long hairstyle perfect for a bride, or for anyone else! 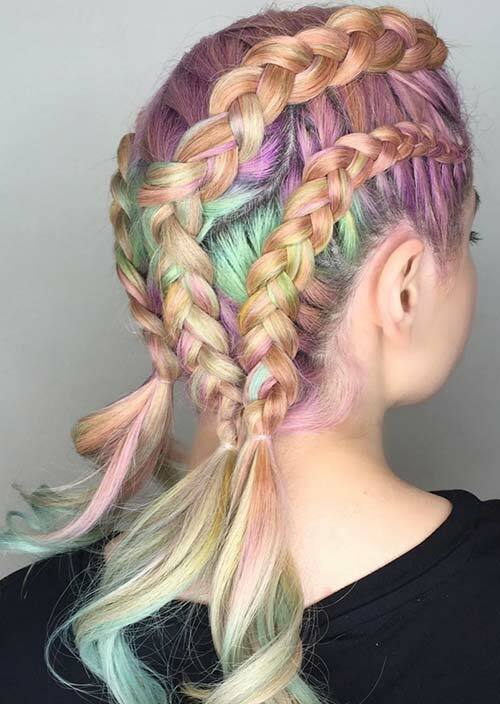 These quirky braids are made trendier and quirkier because of the rainbow hair colors that we see everywhere today. The intricate braiding achieves a sporty look, since they are so tight to the head, and can help hold back some of your length, if you want to make for a shorter style. At the heart of this long hairstyle are long, flowing, wavy tresses. The simple wrapped twist with strands from the front of your hair adds a simple yet elegant touch to your style. It is an easy way to add an extra dimension to your everyday long hair, with a lovely result. This is an elegantly pulled back bun that has a lot of versatility as a long hairstyle. It is elegant enough to be fit for a bride with its twists from the sides to the bun itself, yet still simple and easygoing enough to be worn for a day out; it’s all about how you choose to pull it off! 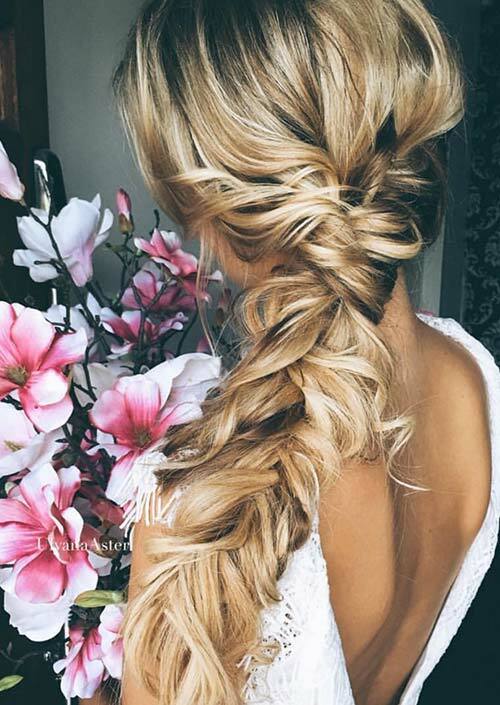 This hairstyle is essentially one long faux braid; at a glance, it seems to be a large and messy braid, yet you can see all of the large twists and loops that actually take its place. It finally does fall into a loose braid at the bottom, so you’re still given that beautiful look, plus the hair color in this style is gorgeous. 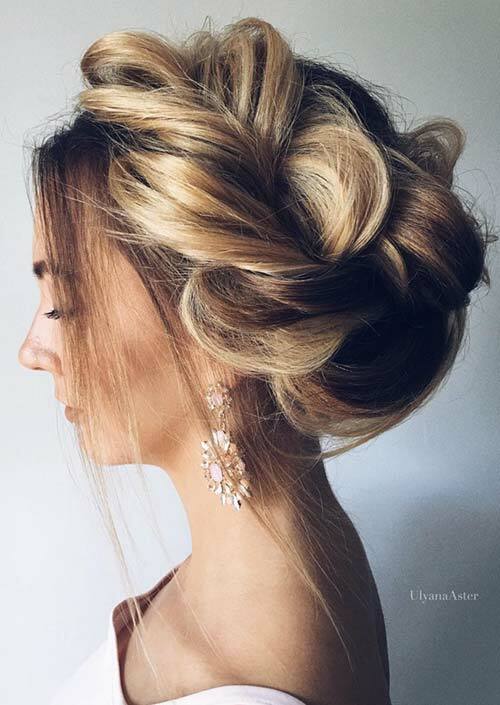 This hairstyle takes a classic, messy low bun and adds in a new dynamic with a braid going down the scalp and leading into the loose yet structured bun. It will add a fun new element to one of the ultimate go-to hairstyles for your long hair. 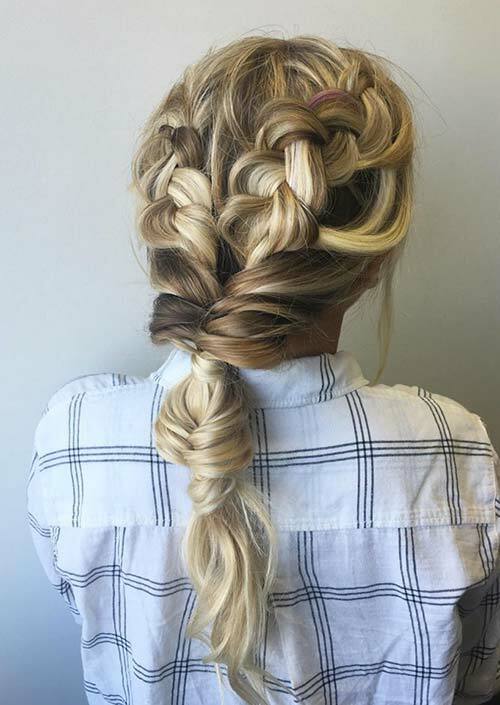 This ‘do flips all of your hair to one side, so you can braid all of it at once into a thick braid. Leaving the bangs loose here gives it an extra edge of casual appeal, and the color makes the whole style right on trend with hair fads of the moment. 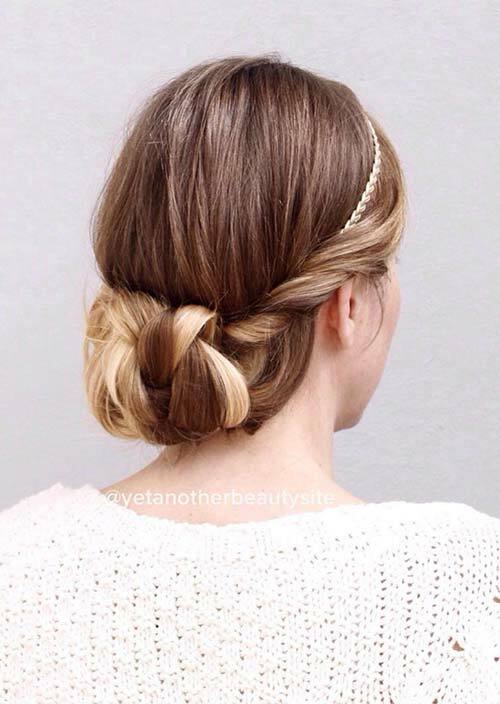 This sophisticated low bun is another elegant and easy twist on a classic bun. The picture shows how well it can showcase trending highlights, and also how easy it is to add in a touch more of elegance with a simple headband. This is another option for long hair that can either be formal or casual. 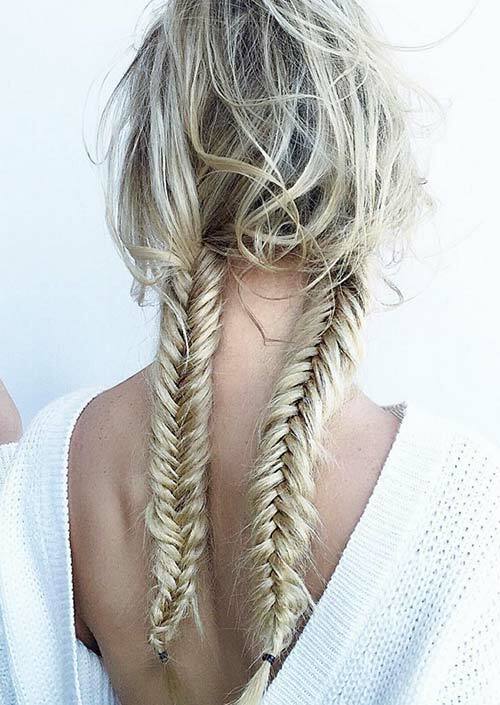 These fishtail braids are a modern spin on the often childish side braids. That adds an element of fun to the look, while still staying modern and rather mature through the color, the feathery texture, and the looseness at the top. Here you have another set of modern side braids. They hang loosely at the side, so you’re getting the rather trendy look of double side ponytails, as well as the beauty of braids. Here they are shown as a mix of edge and sophistication. 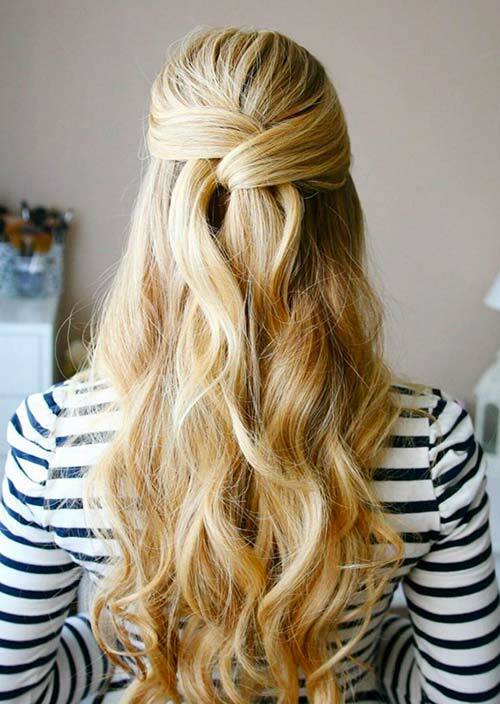 The gorgeous blonde hair in this long hairstyle is kept perfectly in place, yet still hangs loose. It balances elegance and casualness, so the bohemian style can go from day to night in the blink of an eye. All it takes is a headband to accessorize the look, as well. 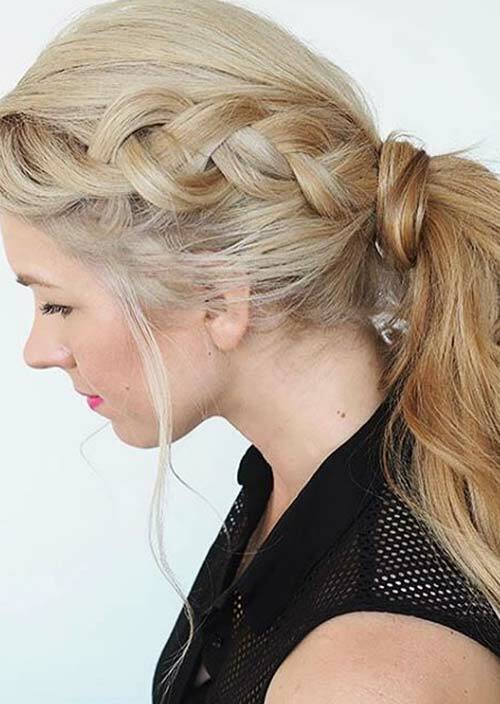 With these cute boho braids, there is a lot of benefit. You don’t have to worry about your long hair getting in your face and you can still show off its length. And as the poster so aptly alluded to in her post with this hairstyle, it dose have a bit of resemblance to everyone’s favorite pirate, Captain Jack Sparrow! This is a hairstyle that would seem right at home at a schoolhouse over a century ago, but of course that type of style is continually coming back into trend today. 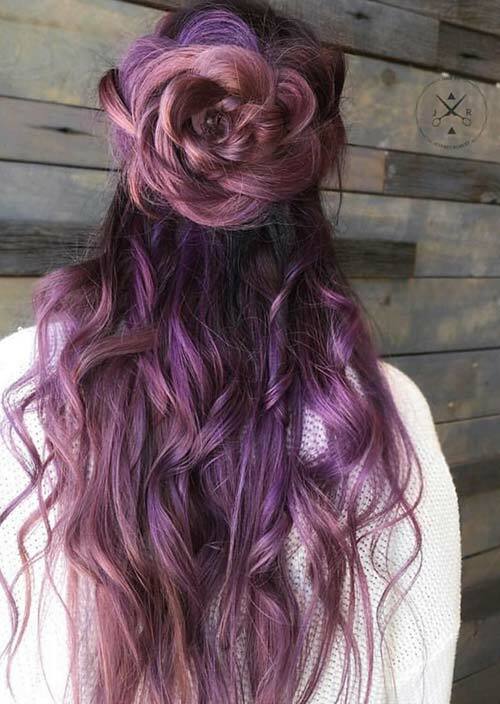 This look is made even more modern with its purple, reverse ombre color. This look seems to have been pulled straight out of an old love story. Like it was the style of a western heroine, or a southern belle, this style is a classic beauty and doesn’t need to be made modern. The loose braid is timeless and elegant, while still exuding some carefree spirit with the loose strands. This long hairstyle has curls that fall right on the fine line between waves and curls. Regardless of what you want to call them, the overall hairstyle is timeless and elegant, perfect for that old Hollywood glamour, or for a classic bridal look, especially with a touch of a lovely accessory. Volume can be such an exciting element for long hairstyles when they’re done right. Too much and you have a bit of a hair disaster, but just enough like in this style is truly stunning. You can have the body in your hair and the lightness of the bangs falling loosely in front. Classically worn tight all around, ballerina buns are a timeless trend, but when they are worn looser, it becomes a lot more versatile. 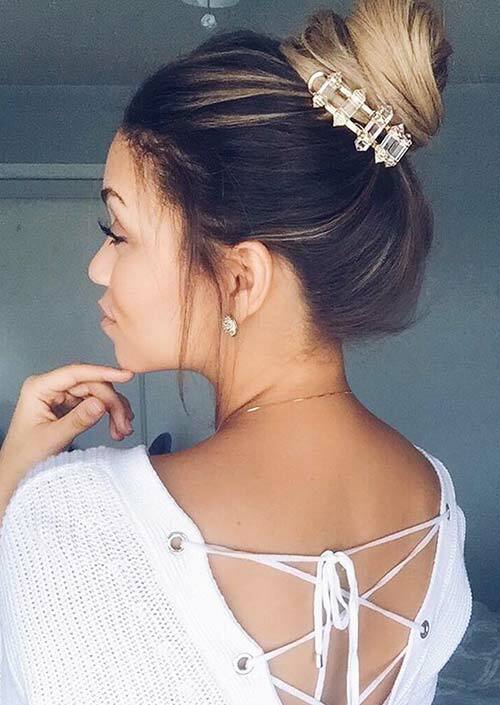 It simultaneously becomes more casual and more elegant, so you can really wear it wherever you need to go and feel right in place; almost as if a ballerina bun and a messy bun were merged together. 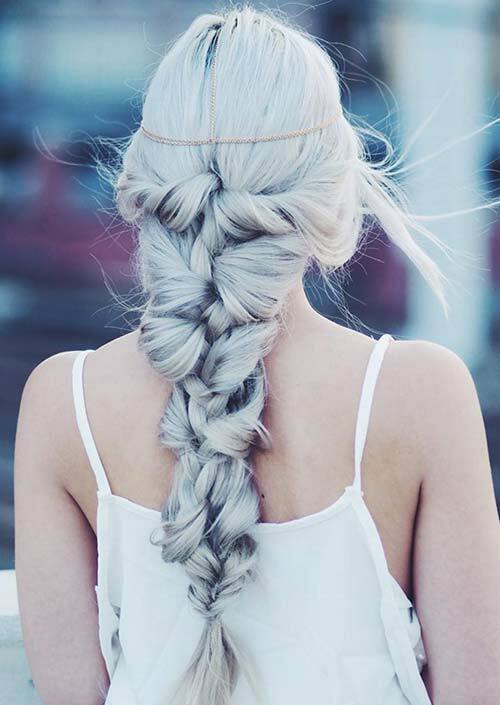 This adorable side braid is as long and well-managed as a mermaid’s hair, especially with the lovely tinted grey color in this photo. With the continual braid coming from one side of the head to the other, the hair can be structured and given movement at the same time. It’s perfect for any time of year. A lazy-chic woman’s dream hairstyle, this hairdo came around as a trend that also promised to hide oily hair if one didn’t have time to shower, say. Just toss part up in a messy bun and let the rest of your hair speak for itself with beautiful curls for a look you can rock all day. Generally speaking, the larger the braid (with the long hair to support it), the more elegant the overall style. Here, that mentality is definitely true. The style is sort of a half fishtail braid, as it’s been loosened up a great deal to achieve this luscious, voluminous effect. 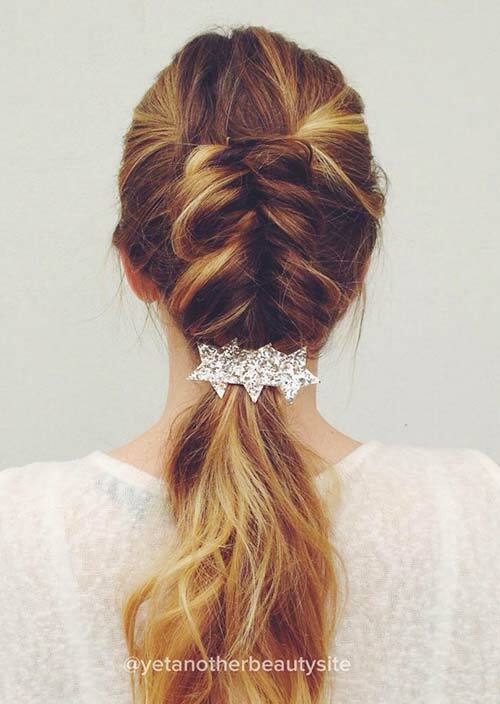 What better way to keep your long hair up and away than to wrap it around like a crown? 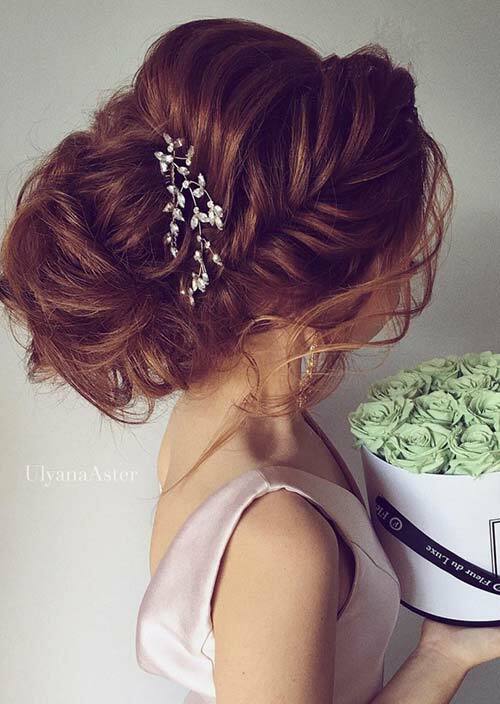 This is an elegant hairstyle for long hair, with twists and loops working around the head in a beautiful updo, with well-placed strands falling around the face for a loose effect; it is great for a formal event! Another old fashioned, almost haunting long hairstyle, this look could be from any era. It is rather voluminous, due to the long hair within the style, and the loose strands help it to be worn for a long time for any occasion, since you won’t quite notice when hairs fall loose apart from what was intentional. Tight braids often have a sportier look, which is true for this style, but the overall styling of the image shows that it can be more sophisticated too. 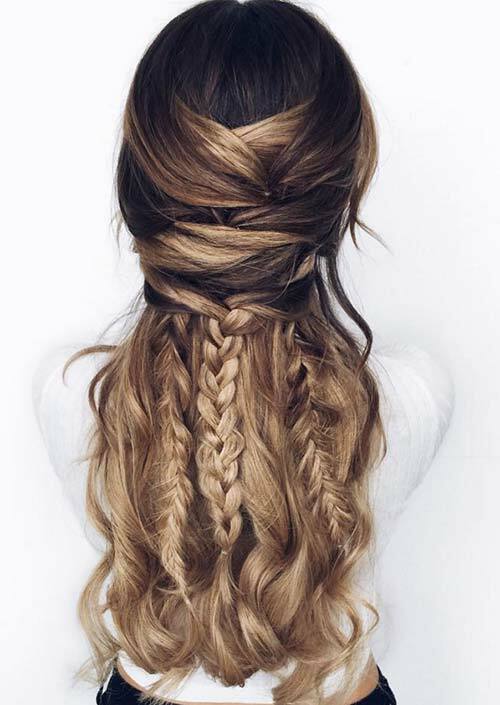 It is made modern in a lovely way, from the deep brown hair as it moves into a lovely blonde at the tip of the hair, spiraling down the braid for an ombre effect. 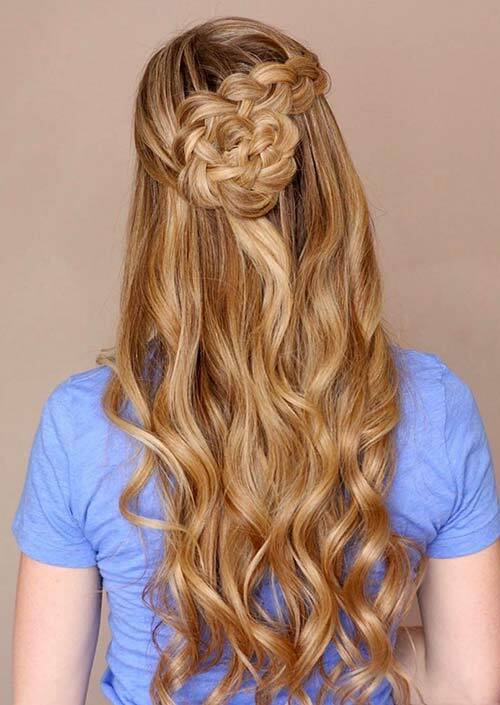 This curly/wavy hairstyle has a lovely way of shifting the hair, with twists and tucks around to keep things interesting. The long hairstyle is beautiful in a simple way, so it doesn’t necessarily require a formal event to wear. A cute headband can really bring some character to the look as well! 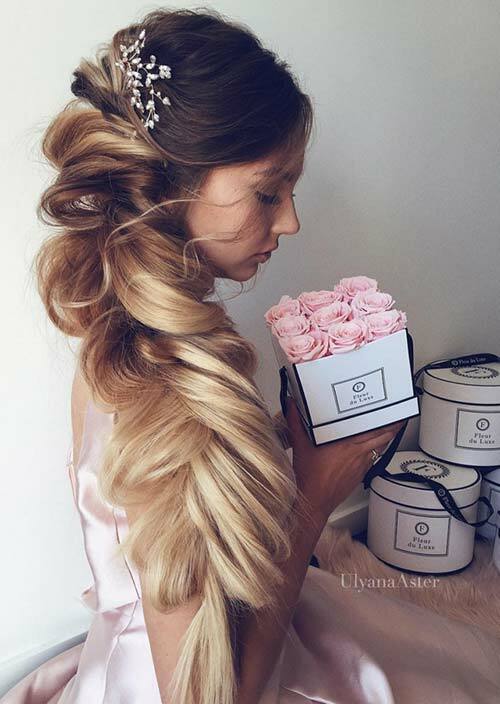 The long hairstyle here is a rather basic wavy hairstyle, aside from its modern pink color and classic glamour twists in the back. This works well with the red flowers in this shot to bring together modern trends and classic, old Hollywood glamour in a beautiful way. You can’t get much better than that! When you have long hair it can get difficult to gather it all into a nice neat bun, so you have to get a bit more creative. By using this braid, you can use up some of your length, while adding this nice touch to a standard low bun. In this lovely blonde color, this look is primed and ready for summer. Going along with the half-up hairstyle trend, this look features a braid where a bun is generally found. In a spring/summer theme, the knot is a similar shape to that of a flower, so you’re all set to go out and enjoy the sun with this fun twist on a modern trend. Sometimes just pinning back your bangs (or the front sections of your hair in general) is all you need for an elegant hairstyle. 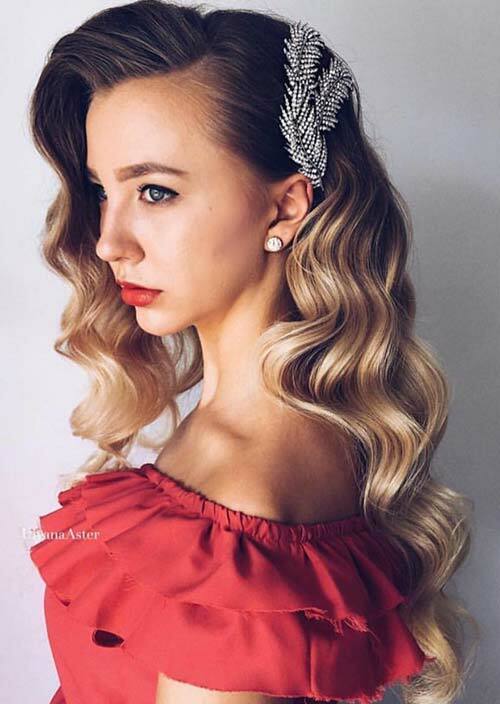 You took the time to grow out your long hair, and a simple curl is always beautiful, so this simple and elegant twist for your bangs will have you simple and sweet for any occasion, formal or otherwise. This cute version of a Dutch fishtail braid actually stops halfway through the hair, before turning into a simple ponytail. The finished style is adorable and can be dressed up or down, and you can’t deny that it’s easier, since you don’t have to worry about going through all of your hair or finishing it off nice and neat at the end! 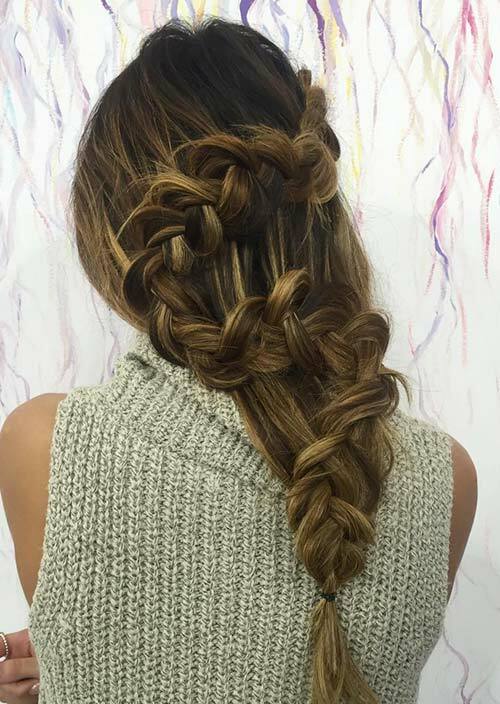 This braid is created by twisting and tucking in the outside strands. 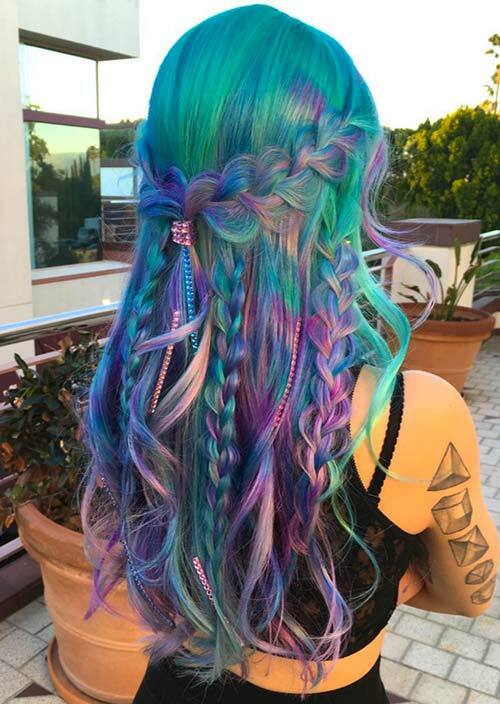 It is a lovely, loose version of a trending mermaid braid, especially with the help of the lovely color in use. 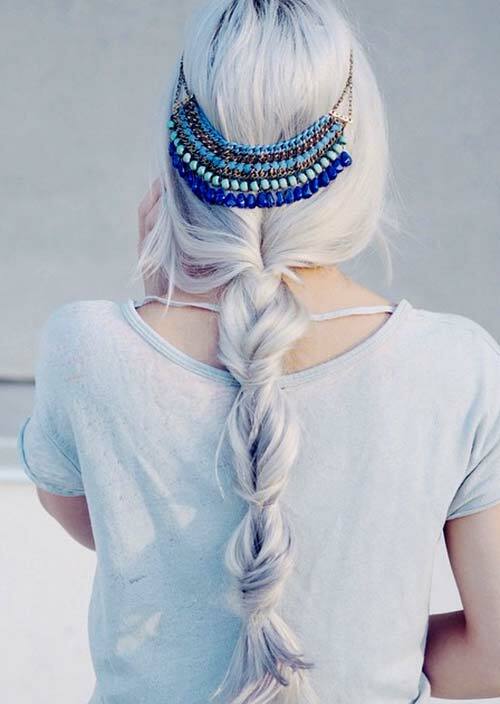 Adding in a cute hair chain just adds in an additional spark of bohemian flair, to add your own personal style to the long hairstyle. Pulling back your bangs can actually add a lot of character and texture to your long hair, especially when it is braided in such a way as this. Adding in the knots brings a new dimension to the long hairstyle, and makes for an overall more unique look that has a great structure to it. Ponytails are always great go-to hairstyles for women with long hair, but this style adds in a little twist. Adding in small braids from the strands at the top of your head adds texture to your ponytail and an interesting visual appeal, so it will spice up a gold standard long hairstyle. A trending cool girl hairstyle, this is a look exclusively for women with enough length and volume in their hair to pull off such a style. You need quite a bit of hair to get the proper lift to your braid, especially since in this version the knots are so large. Rather than braiding, this adds a more natural feeling to the look as well. Looking elegant and ready for the aisle, this is a side fishtail braid for long hair that has a glamorous execution. The hair seems to be beautifully folding into itself, and the loose version of this classically tight and structured braid adds in an unrivaled sense of beauty and luxury. With the lovely vine accessory in this braid, as well as the general style, the likeness to that of Rapunzel is stunning. 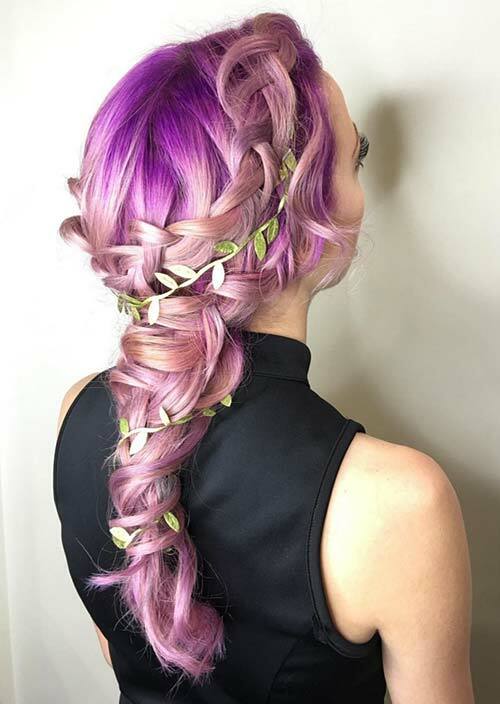 The purple hair of this long hairstyle is a lovely and modern shade, and the flat, twisting braids are a simple yet elegant way to show it off for summer. This is a staple hairstyle for long hair, as it is simply a bun pulled back at a mid-level, loosely enough to not seem uptight and tightly enough to keep strays at bay. The addition of pearls here only enhances its sophistication, moving the classically luxurious accessory from the neck and ears to the hair. 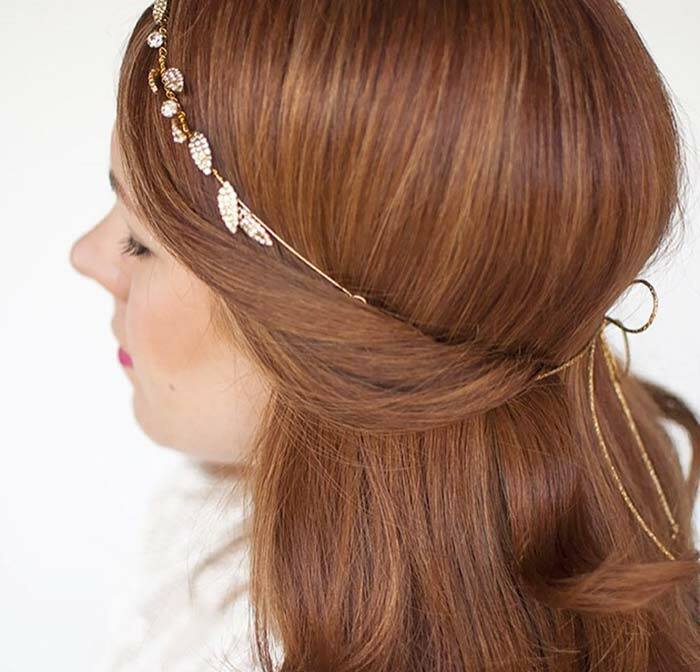 This long hairstyle requires a simple, lovely headband to keep its folds and wraps in place. 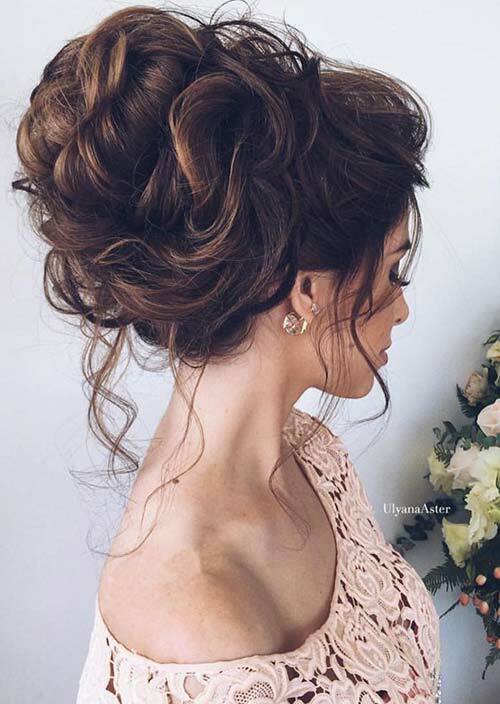 The loose updo is elegant in its simplicity, and with its nearly symmetrical tucks in the back, there’s nothing too abstract that stands out, yet the hairstyle calls for attention due to its lovely appeal. 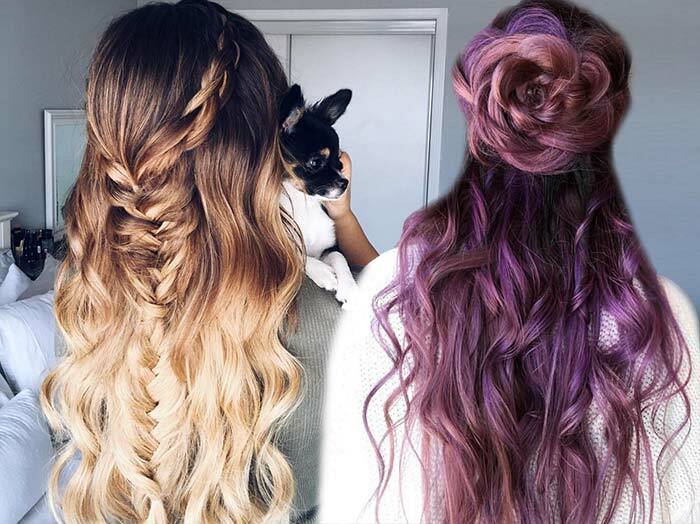 Combining these two braid types makes for a bohemian long hairstyle. The French braiding along the top leads into the wide fishtail for the rest of the hair, and is worn in a loose, casual fashion. The result of the style is easygoing and straightforward, despite the complex work put into the style process. 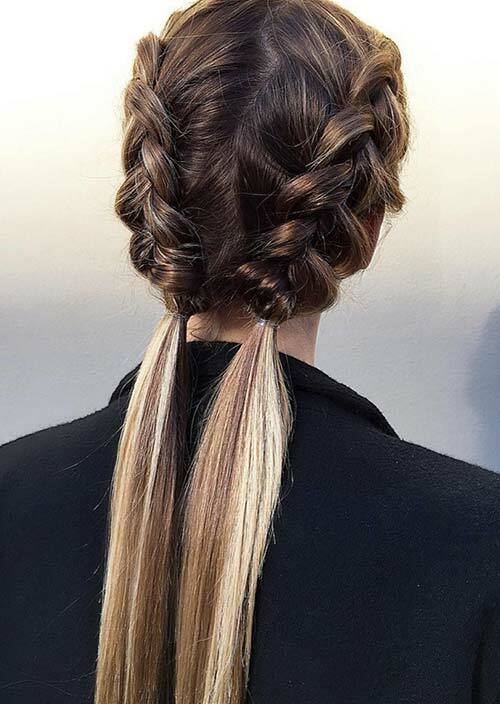 When two hair trends merge together, great things happen. This long hairstyle features the hair bow and half-up trends, and brings them together in a natural way that looks fabulous. It’s made especially cute by letting your long hair wave and curl slightly, in a pretty way for any occasion. The ponytail is one long hairstyle that has never (and will never) go out of style. This particular style is one that is reminiscent of the ’80s, falling in a loose, carefree way. But then again, that’s just as popular now than it was then, so in the end it’s still a modern long hairstyle! Some curls are light and breezy, while others like this full, voluminous hairstyle fall heavier with fuller curls. Sometimes the best way to show off your length is to bring out the best of the density and volume, and from there you can choose to style it up or leave it down like this beautifully colored hairstyle. 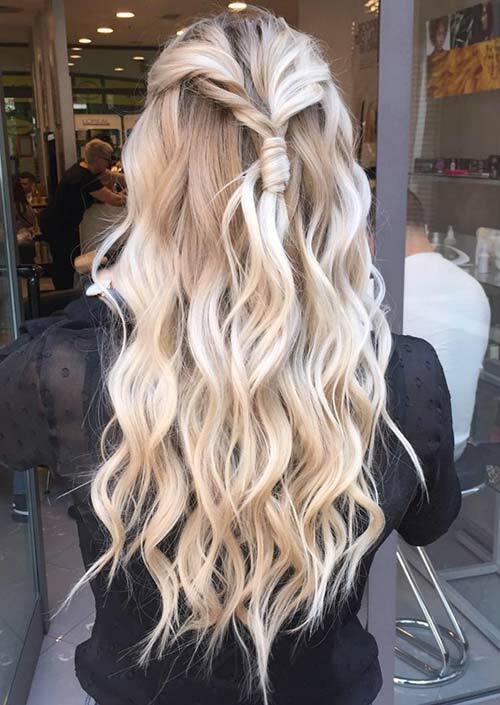 The spiraling twists of this long hairstyle are rather unique, and are what ultimately make this look worth nothing. It is also beautiful to note that the hair remains straight until about a foot from the end, where it becomes wavy. The style is super casual and easy to wear, yet has a delicate sense of intrigue about it. You can add some elegance to your messy bun by braiding strands to be wrapped around the bun itself in a crownesque fashion. You can still let your baby hairs fall loose, and show off different colors in your hair as well, in this new layered way. This interesting side braid is a perfect long hairstyle, since you don’t have to worry about incorporating all of your hair into one braid. 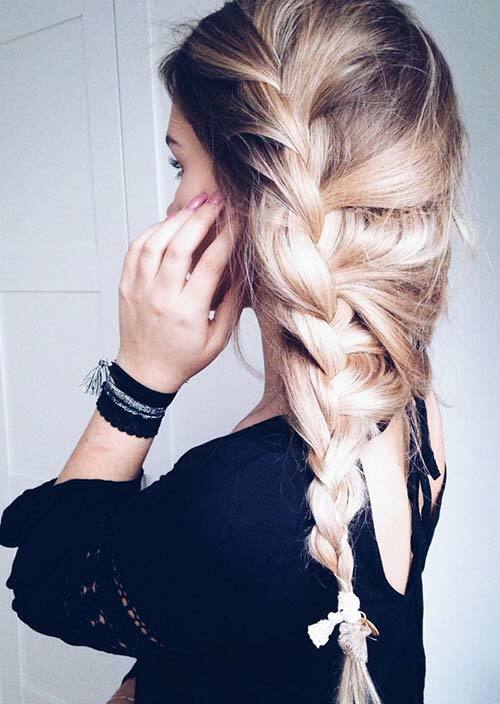 This braid is characterized by the large strands of hair being pulled from the far side and brought into the braid, giving a unique and appealing visual. With hair tattoos being a modern trend, you may be looking for new hairstyles to show yours off. 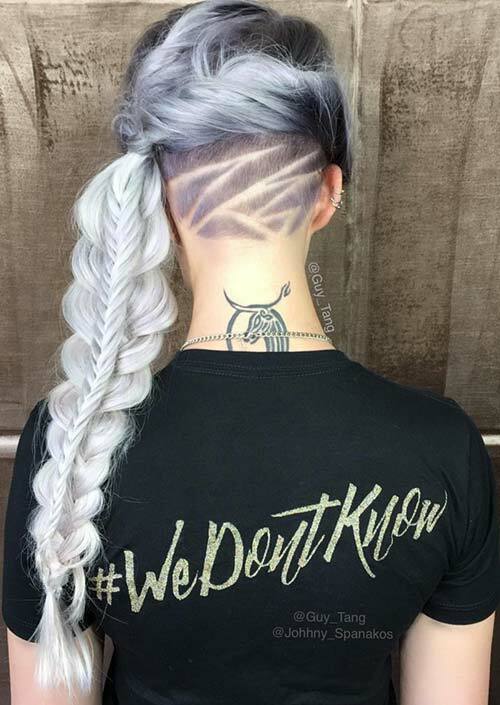 This style is made for undercut long hairstyles, and it helps keep all of your hair in place to one side, allowing for optimal image visualization; plus, the beautiful fishtail braid like this is a trend in and of itself. 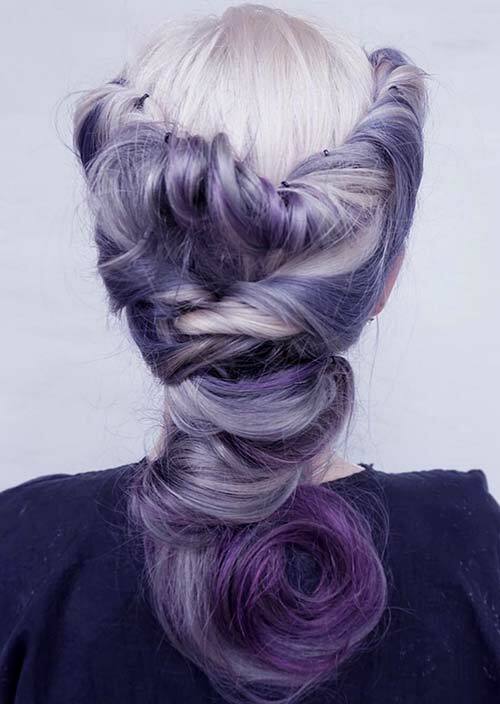 Not quite a ladder, but the back detail of this beautiful hairstyle certainly has the image. 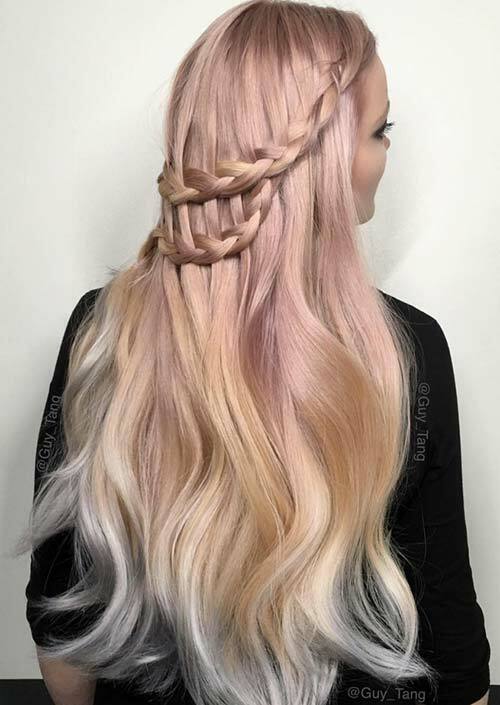 Let your long hair flow in the wind, while still adding in some great character and beauty from this sleek braid detailing wrapping around the back. It is made even more beautiful thanks to the rose gold ombre coloring here. When executed so expertly, rainbow colored hair is the most beautiful thing, especially (in my opinion) with long hair. 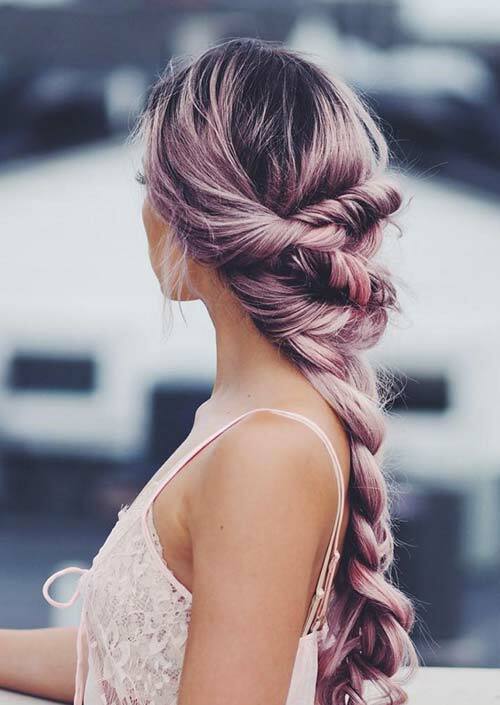 This long hairstyle shows how such colored hair can really pop with multiple braids coming together and creating some great movement and texture along with it. When you have all that long hair, sometimes splitting it in half makes it a lot more manageable. These double braids give you all the great, sporty sleekness of a single fishtail braid, but it’s more interesting and also easier to wear! It’s a great way to leave your hair a bit messy while keeping it structured. 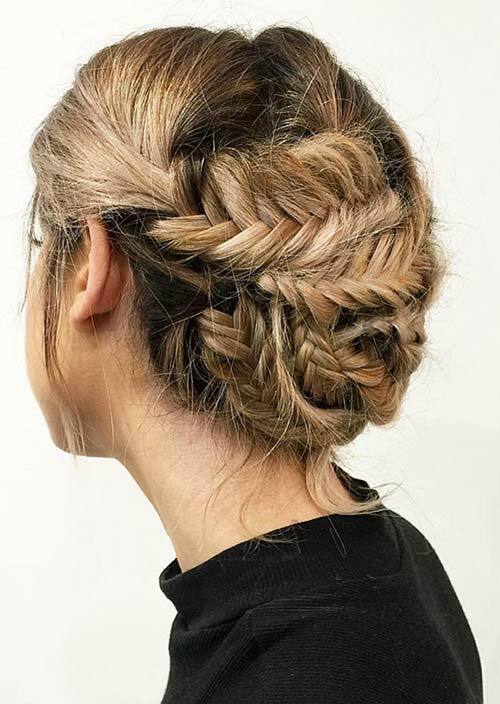 With all of the hair pinned up into a single braid starting at the top of the head, bumping it up with some volume adds some fun and brings a new element to classic braids. This is a style that works well for formal yet laid-back occasions, among others, since the long hairstyle itself is structured yet loose. 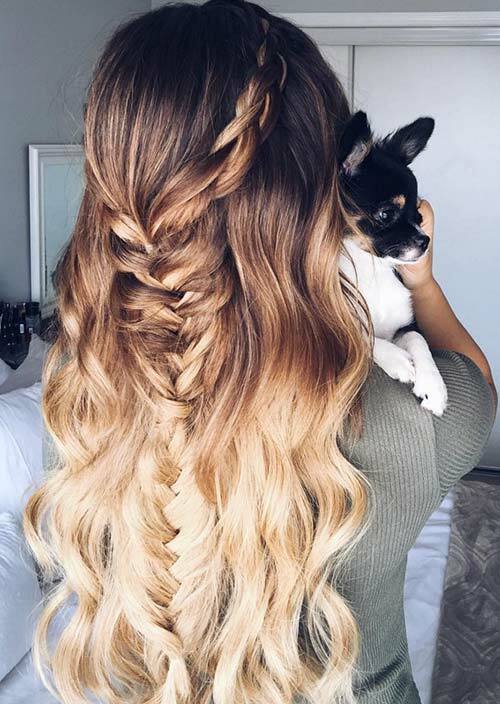 The overall look of this cute hairstyle for long hair is totally classic, but the truly stunning part of it is the fishtail braid detail done on the side. You can’t quite see the braid itself, as it is woven into the hair and updo, but the style is distinct and adds a touch of care and extra elegance to an already elegant hairstyle. With a structure weaving together almost looking like wooden blocks, this blonde long hairstyle adds additional layers to a staple low bun. It’s wrapped to stay tight, but still stays loose in the front to give loose hair the chance to enhance the casual appeal of the style. Why worry about choosing the perfect headband to complement your elegant hairstyle when you can just use your own hair instead? By creating small, tight braids, you can manipulate them to act as a headband, while the rest of your hair is pinned back in a classic updo. Listing all the details sounds like a mouthful, but the result is actually quite simple looking. 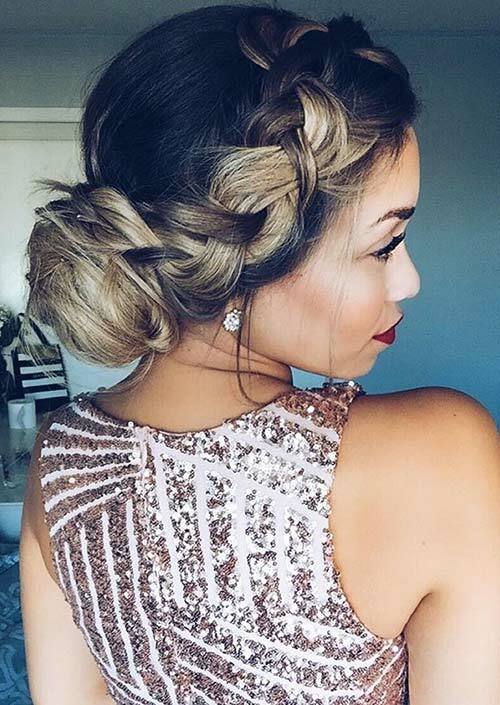 Sometimes it takes a lot of work to create simple elegance, like in this braid/bun combo hairstyle. The French braids here add texture and beauty to the simple hairstyle, without overpowering anything. This is an interesting long hairstyle, for many reasons. It is a take on the classic riding hairstyle, with the top part of the hair braided in medium sized braids, and the rest falling as sleek ponytails. The difference there is the most visually stunning piece, especially with the differences in hair color between the two sections in this image. As large, almost bumped up braids starting at the top of the head, these double Dutch braids make for a great long hairstyle. The symmetrical dual styling is elegant and sophisticated, while still having that youthful styling of braids and pigtails as well. When you have long hair, you get used to having some great volume with your hairstyles, and braids generally are used to tame that. However, bubble braids can help you keep that volume and also enjoy having a stylish braid. It adds a new dimension to classic braids, and can be styled for any occasion. 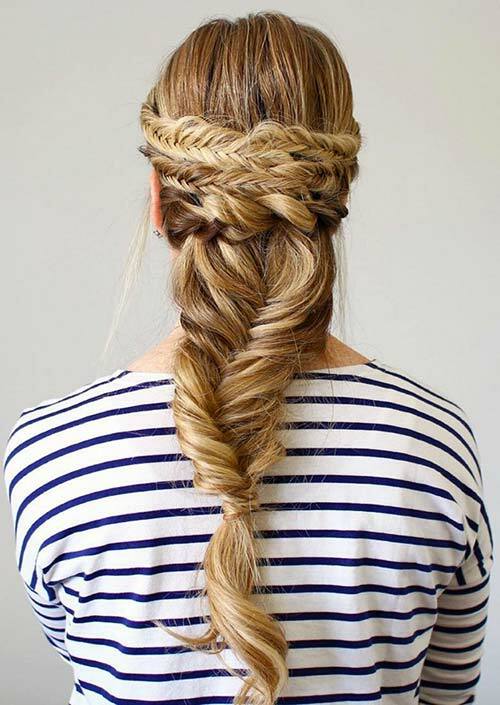 For this easy long hairstyle, you just need to start with some fishtail braids. 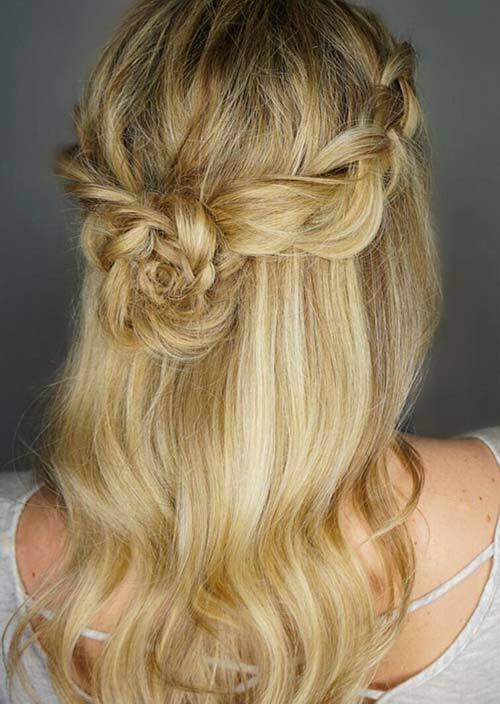 The braids are tucked up and wrapped around one another to create this beautiful updo that’s perfect for summer. Fishtail braids are already associated with summer, so this way you can have that style while keeping your hair away from your neck and face. An essential styling for anyone with long hair is perfect curls. It’s a style that everyone should definitely be using every now and then, at least, especially since it can be a start to such a lovely and elegant hairstyle. With full braids coming back and down part of the head, there is just the right number of elements going on to keep the focus on the beautiful long hair. This intriguing braid style is half up (in the braid) and half just straight and tapered at the end. The S shape from twisting through the long hair is an elegant way to detract from the volume of your hair, while adding a unique element that also adds texture. 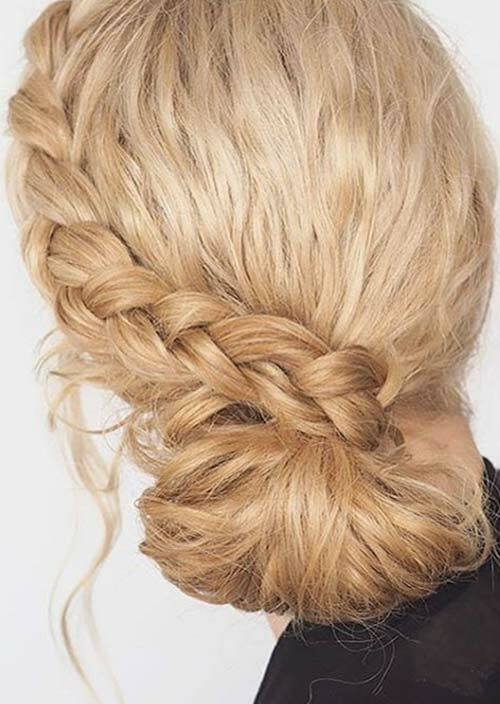 It is a beautiful way to spice up a standard braid. It doesn’t matter what style you like to wear, wavy hair always has a place in your hairstyle repertoire. 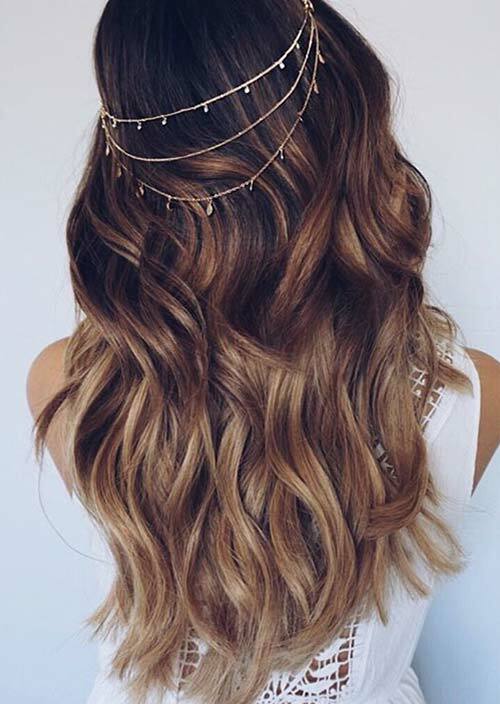 This image shows a perfectly placed wavy hairstyle, made complete with a cute hair chain; replacing the accessory could take this look from Coachella to Warped Tour in an instant. 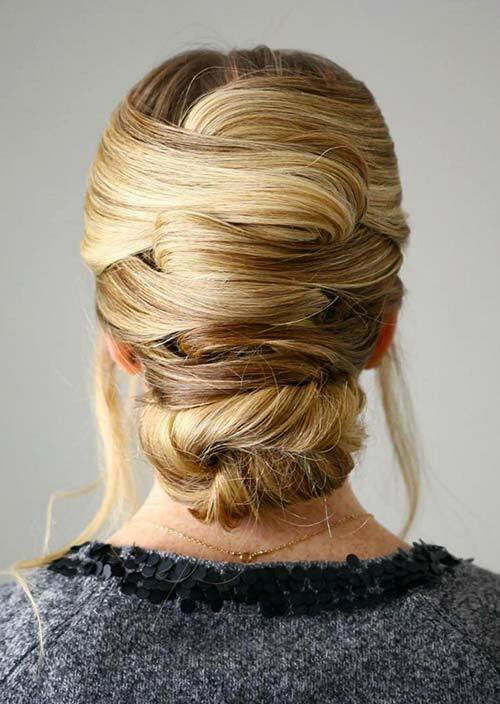 The smooth braid in this beautiful long hairstyle wraps perfectly back into a sleek, low bun at the back of the head. It is an elegant style that can also translate through any time of the day, so it’s a great way to add a bit more sophistication or beauty to your daily look, or as a style for a formal occasion. This long, beautiful side style is totally structured, with tight braiding keeping every hair in place. The most interesting part of this hairstyle, though, is the wound hair at the top of the head, forming beautiful flowers via small braids. It’s a downright angelic look that adds great femininity to your looks. 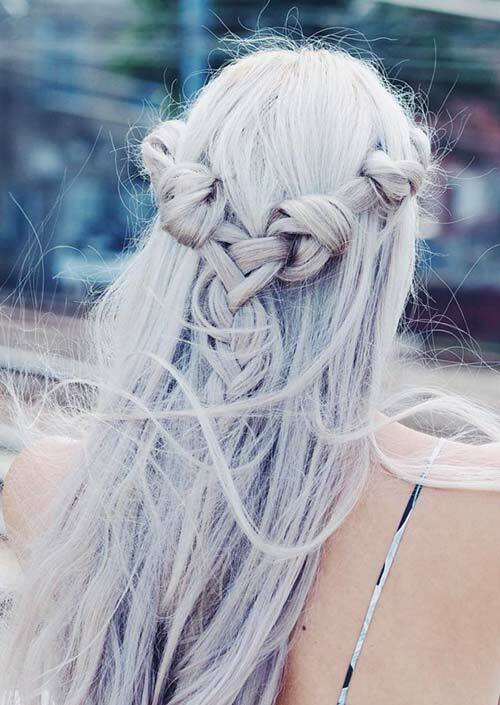 Braid crowns are always a lovely touch to long hairstyles, especially since they’re also actually practical. Making it a fishtail braid gives it more direction as well, with the center line being so predominant all along it. 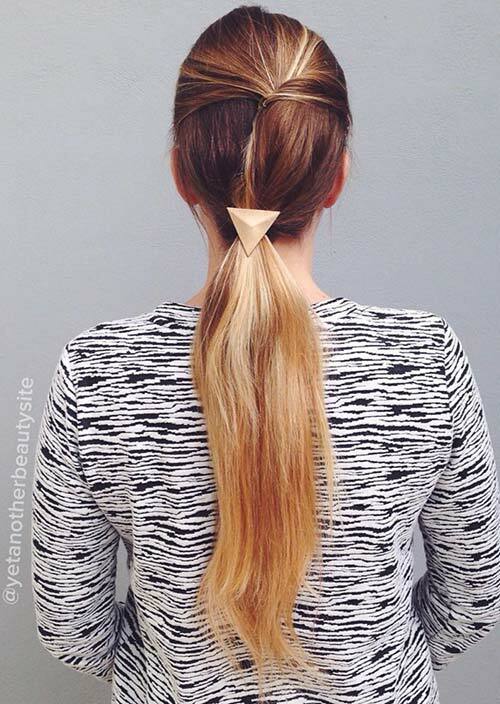 Sliding off into a natural ponytail, this casual look is perfectly balanced. 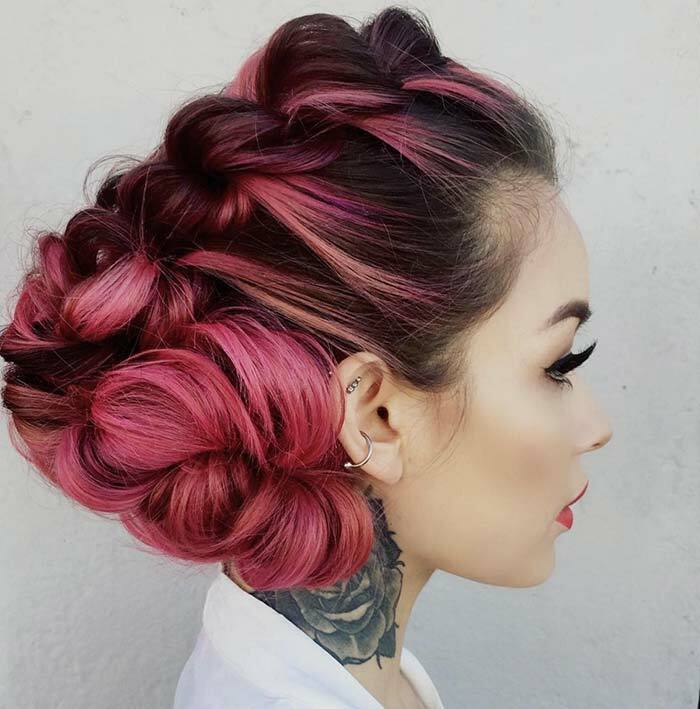 The color in this bun hairstyle is perfectly showcased, thanks to the weaving waterfall braid leading into the bun, which is loosely kept to the side in a casual yet beautiful way. It gives the illusion of having shorter hair, while still being able to keep all of that beautiful long hair up and out of the way. The structured Dutch braid in this hairstyle goes straight down the middle, creating an essence of the trendy mohawk braid hairstyle. 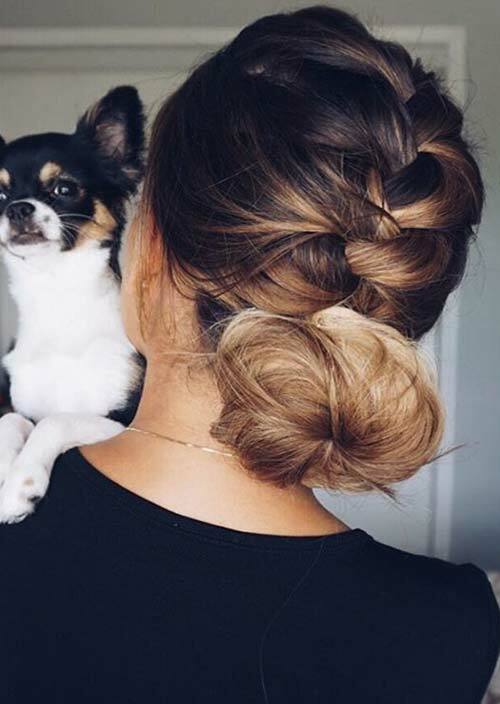 The loose, messy bun that comes at the bottom of this style is made with a lot of care; messy buns take a lot of work to make look effortless! This is a bohemian braid, created in a simple way with loose strands coming together with beautiful structure and ease. Plenty of people use hair chains to amp up their hairstyles, but this image shows that necklaces can be used for a similar effect! 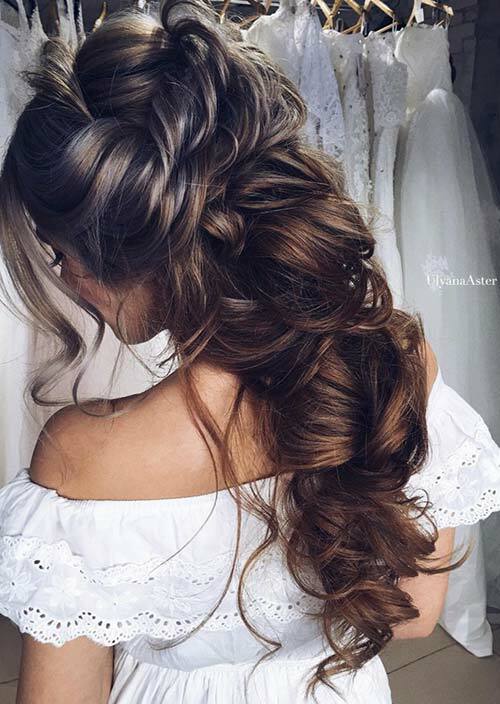 This long hair updo features cascading strands that hang in a beautiful and feminine way. 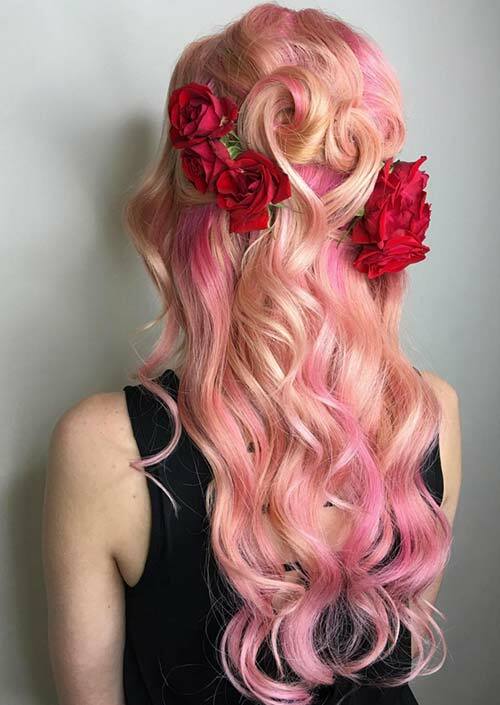 There’s something so floral about the way the hair already is, and adding in the lovely flowers into the hair just takes it to the next level of feminine beauty. This is a style you can play around with and find what exactly works for your long hair. 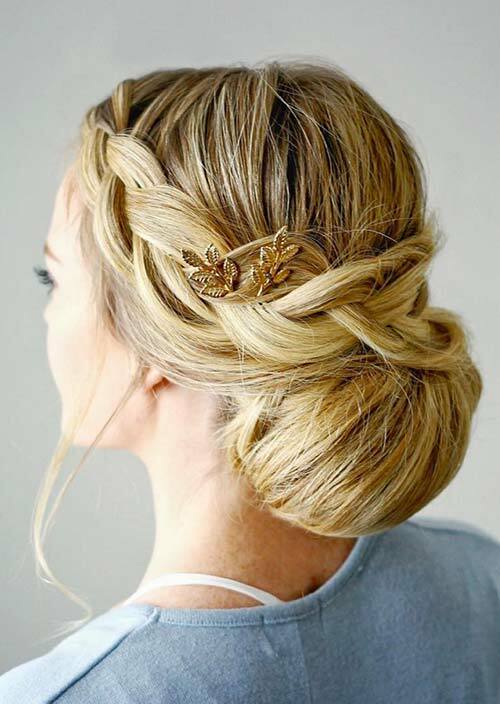 With the majority of your long hair hanging free, this look is given character thanks to a lovely, simple braid crown that leads back into a flower bun at the back of the head. Nothing screams spring/summer quite like flowers, so having the hair itself turning into the bloom is a lovely rendition. This braid is kept sleek by using large, pin-straight strands of hair to create a simply constructed braid at the side. The bangs, however, are pulled straight back, at the beginning of the actual braid, creating a modern, edgier appearance. Braids can sometimes be overtly feminine, but this one shows constraint. 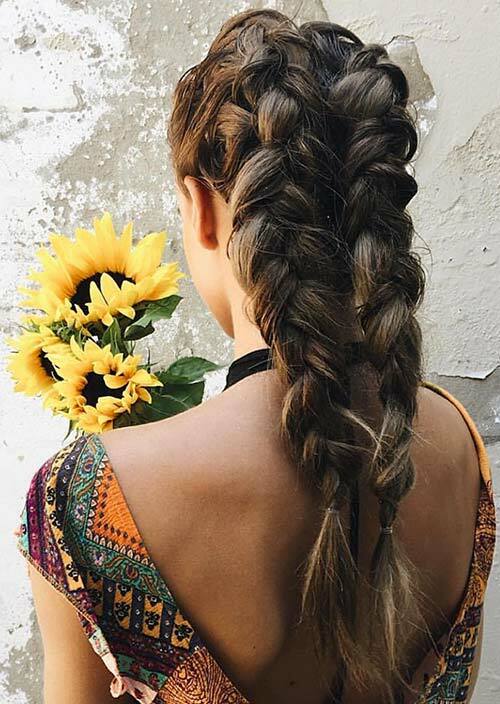 This intricate braid is a great example of a feminine long hairstyle, especially with the cute flowers poking through at various stages. It’s a great hairstyle for very long hair, since you can pull all of the different strands into a complex yet structured beautifully easygoing braid. These side buns are strange and quirky, yet super cute ” almost in a Princess Leia sort of way. A lot of the hair is left loose and free, with the buns being structured and held back. It’s a great way to keep long hair up, without having to pull at the strands and put them into stretched locations. This long hairstyle is smart and sophisticated, in that it looks as though it could easily be a part of a schoolgirl or riding outfit. It’s sleek and mature with a youthful twist, with intricate braiding creating the effect. The cascading effect isn’t easy to create in such a sleek way, but the result is worth all the painstaking work. 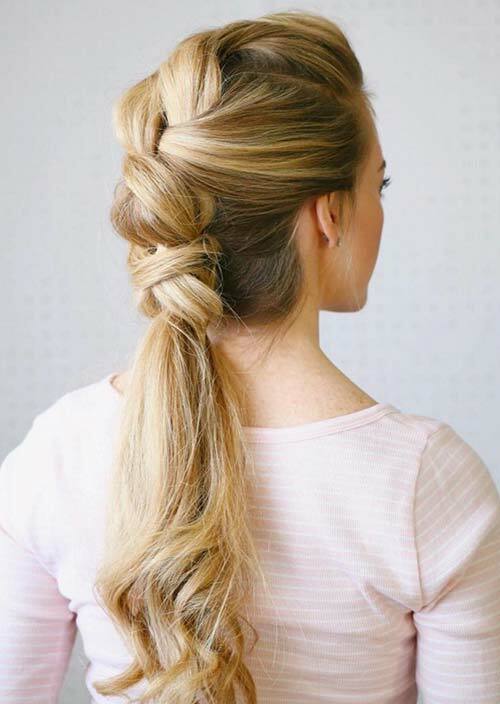 The braid detail of this ponytail is so simple yet intriguing, since it only goes a few inches down the hair before trailing off into the flowing length. It’s a look that has a subtle elegance to it, but is still a casual, lazy day hairstyle for long hair. It’s a great student look for all ages, but for any other daily occasion as well. Since this particular style is purple, it’s very striking. 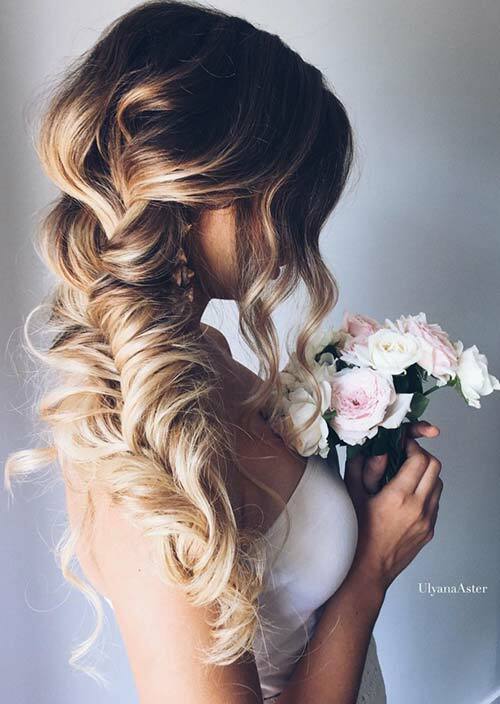 Even despite that, the beautiful flower braided at the back of the hair is already striking, which makes the curly hair almost give the illusion of roots. Who needs accessories when you can do something like this with your hair? Braided pigtails have a sense of childish nostalgia about them, but this particular style brings it into the modern age by starting the braiding right by the part of the hair. It brings a surprisingly significant twist to the style, while still keeping it simple, classic, and casual, complementing the loose strands. 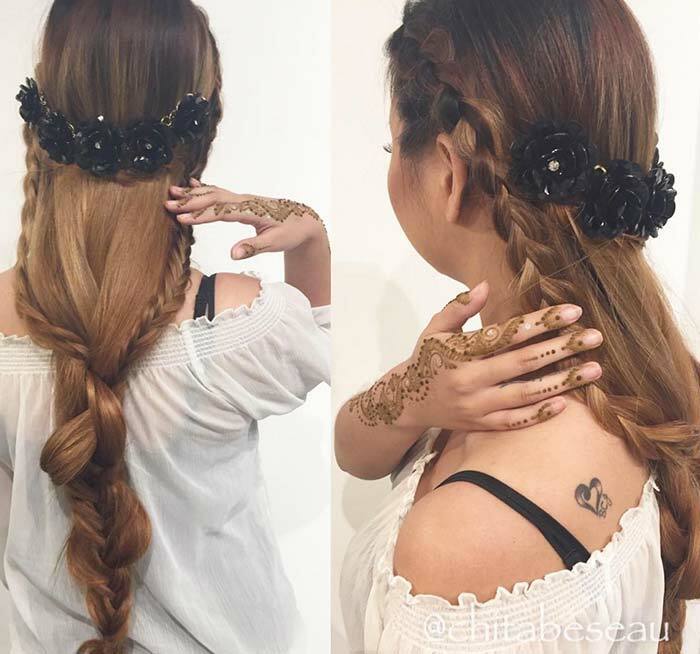 For any occasion, this thickly braided hairstyle is perfect for long hair. 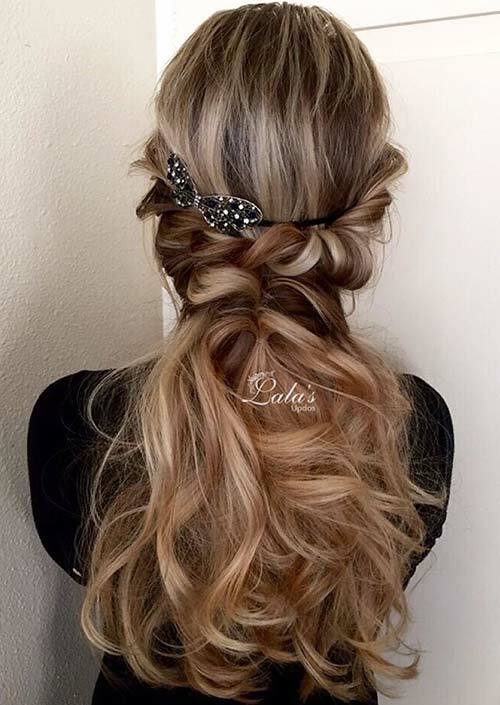 It can be a daily style or for a formal occasion, especially when you add in little accessories to the tip of the braid, like flowers or other clips. It’s a great way to celebrate the length of your hair. That half-shaved look is a great, edgy trend, and I’d say it’s even more fashionable when the buzz is replaced by cornrows. It adds some texture to that side of the hair, and also takes away the risk! If you decide you don’t want that style anymore, it’s a lot easier to ditch the cornrows than to grow out a shaved side. Adding just a bit of texture to a classic bun, these double Dutch braids work up along the scalp and into the base of the bun. They are a clear focal point of the style, yet still manage to stay subtle since the hair stays loose enough, not pulling the hair into tight braids that would otherwise detract from the style. This is a very loose rendition of a waterfall braid, since the strands being braided were woven so loosely with the rest of the hair. It leaves an interesting, yet simple crisscross effect that’s elegant and fun to look at. The precision is remarkable and creates this long hairstyle that’s simply cute and flirty. 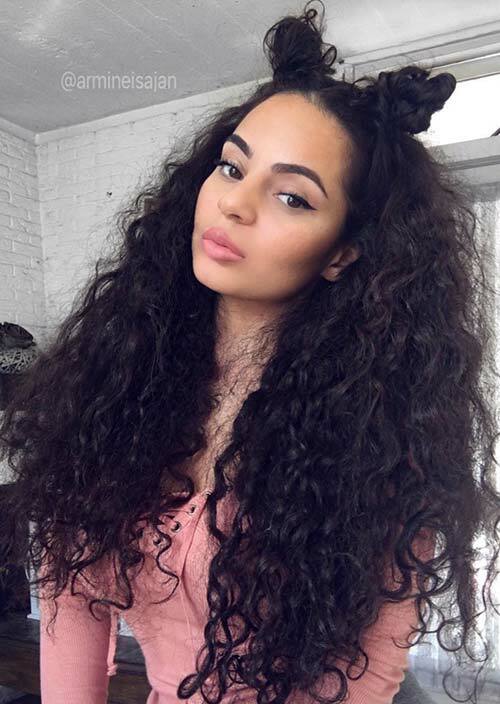 This is a hairstyle for long hair that brings in a crazy amount of volume with cute buns at the top to bring in some fun. They definitely work to help keep some hair away from the face while still not messing up any of the volume or structure. It’s a simple and zany way to add a new style to your repertoire. Starting with straight hair, this elegant long hairstyle doesn’t have any in-your-face qualities or accessories, yet is so sophisticated because of that simplicity. All it takes is a thin headband to create this effect, by tucking some of the hair behind it, making layers and folds that add some depth to your long hair. There are no embellishments on this hairstyle. It’s a straightforward style you can easily create with your beautiful long hair. It starts with a simple (yet perfect!) curl, and is finished off by twisting strands from the front of your hair and knotting them in the back with a loose knot. At a glance, this long hairstyle seems like a simple twisted strand held to the side, but it is actually a loose Dutch fishtail. The puffy volume allows the length to be shortened, and also less sporty, which can either make your overall look more elegant or edgier, depending on the outfit and makeup you are wearing. This is a romantic iteration of a crown braid, with sweet loose strands falling around the face. 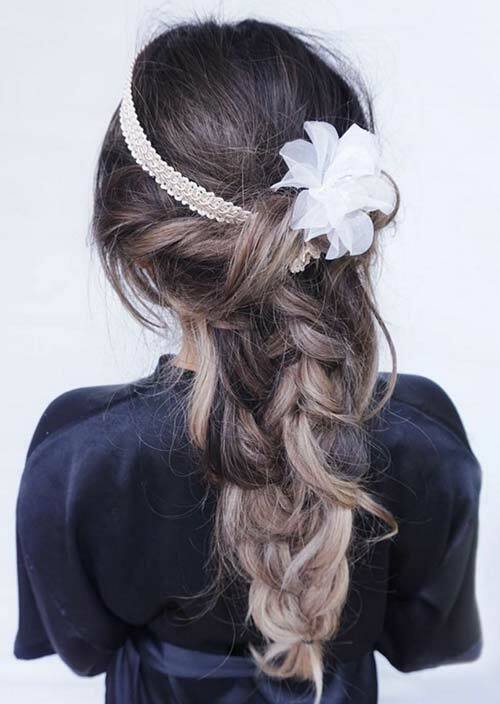 It almost becomes more of a halo than a braid, since the romantic look becomes nearly angelic. Yet, the crown is given more volume, lifting it up and away from the head, due to the multiple braids and positioning. 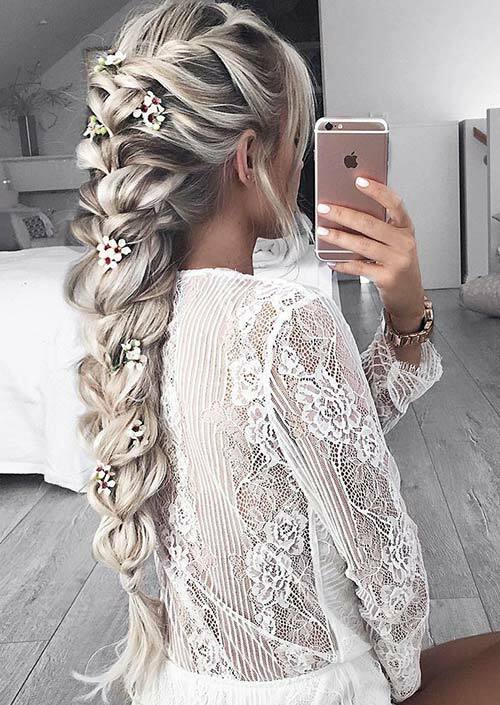 Another beautiful side braid creation for long hair, this style is totally summery, and would look darling with some cute floral details either woven into the braid or as a clip at the top of tip. It has a great level of elegance as well, making it perfect for a summer wedding, or even just as a daily hairstyle. The braiding and interlocking of the hair in this beautiful hairstyle for long hair is exceedingly intricate. I’ll be the first to say how difficult this hair looks, let alone how difficult it is to get right, but when done correctly, the strikingly angular shape is comparable to no other. It is a show stopping hairstyle. 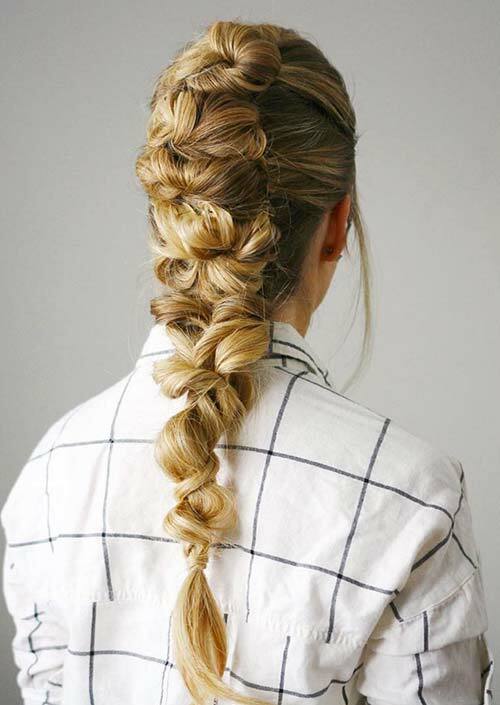 These chic braids look super soft and feminine, while still being trendy and youthful. 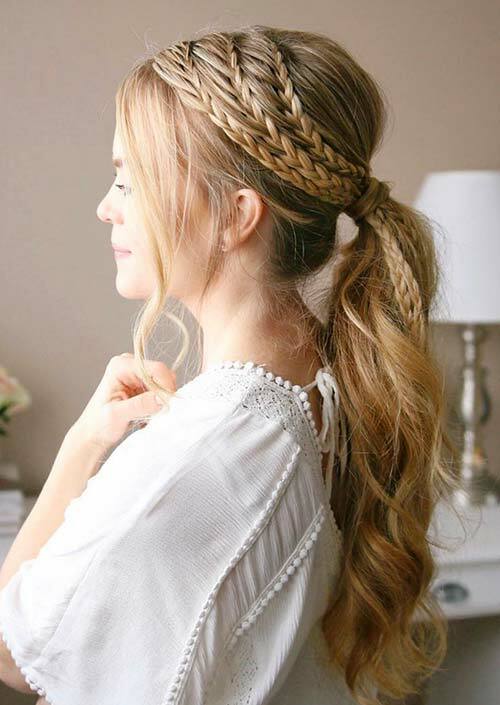 At the top of the head, these braids are tighter, but ebb into a loose style; it is a perfect hairstyle for long hair that has some light volume to it. It’s essentially an elevated pigtail! 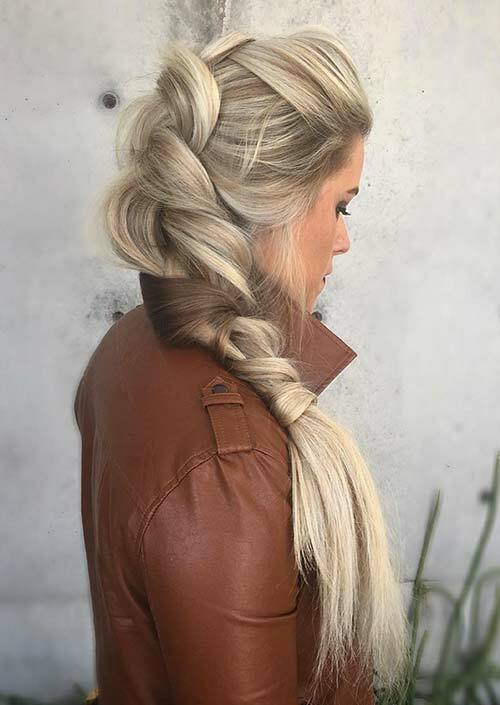 The braid here is actually only on the top of the head, taking a majority of the hair and volume into this one area, while the rest is left to fall in a simple, wavy ponytail. It gives the hair an overall edgy overhaul, making for a modern and unique long hairstyle, in a neat and updated way.